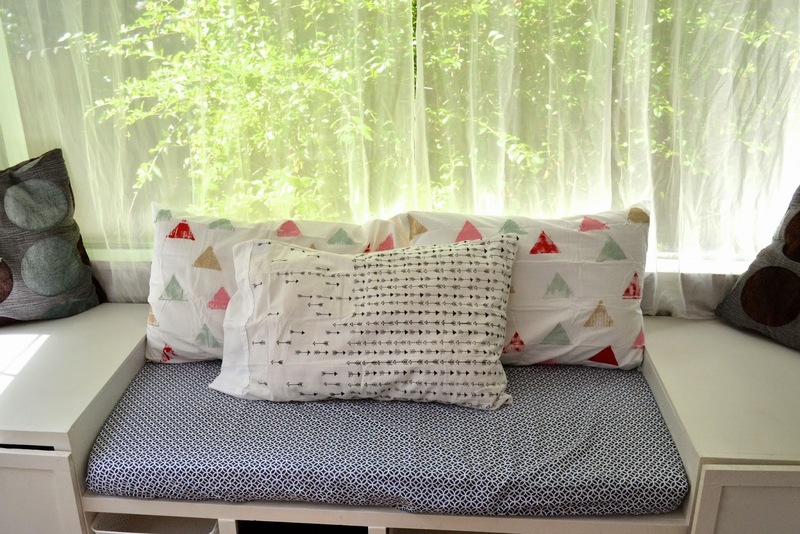 With the new sunroom bench built, it was time to make it more toddler friendly... aka softer. 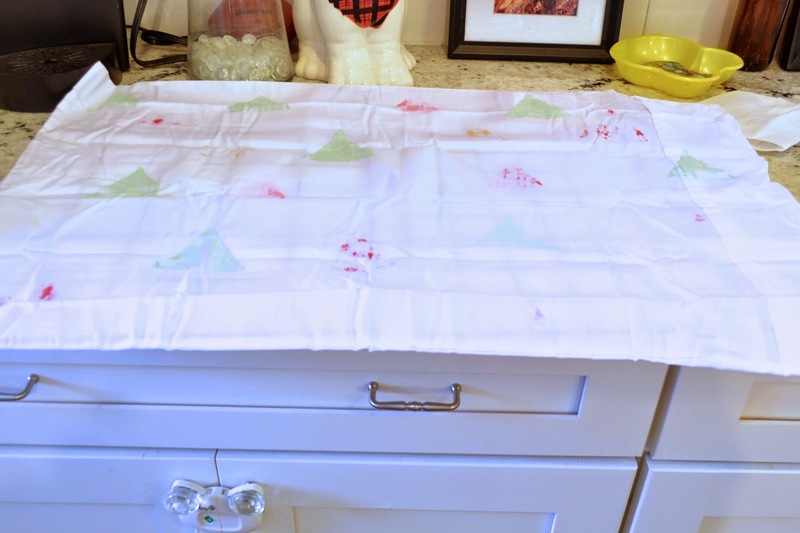 We made the seat of the bench the exact size of a crib mattress and so we picked up this inexpensive one from IKEA. This took care of the seat cushion, but we still needed some soft back support. 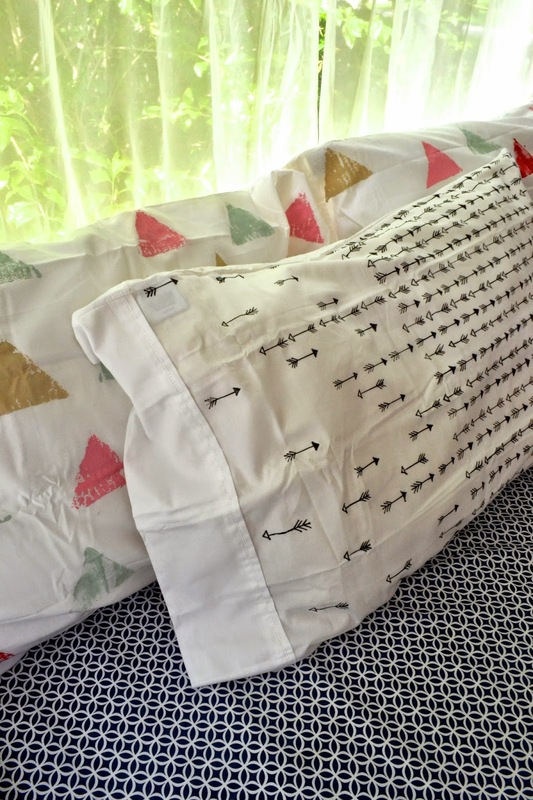 Since this area is going to be Will's playroom, I decided to get a little crafty and DIY a few fun pillow cases. 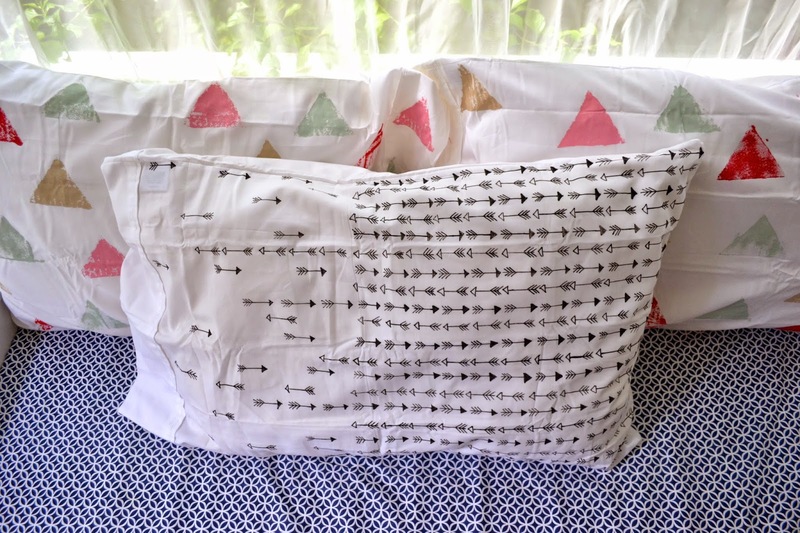 Initially I was going to buy some fabric from Spoonflower that I really liked (a triangle print which you can find here and an arrow print here) but when I looked at it on the "yard" setting I realized the scale was too small for what I wanted and $17.50/yard was going to add up pretty quick for 3 pillow cases. Instead, I went to Target and got 2 packs of their ultra soft pillowcases (which comes with two each) in white (do you know that it's almost impossible to find white pillowcases two weeks before colleges start up?? ), four different multi-purpose paints from Micheals, and a black paint pen. I couldn't find a large triangle stamp so I cut an old sponge into a triangle and I was good to go. 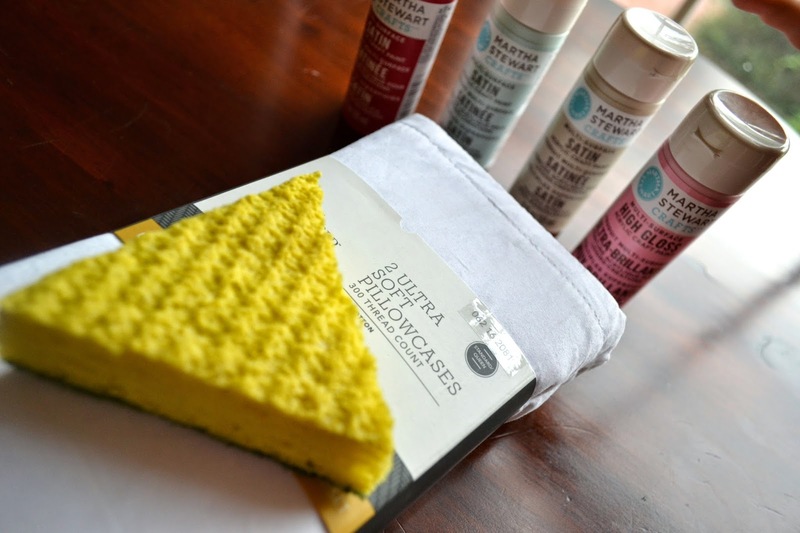 I used the sponge and the paint to stamp two of the pillowcases. I used one paint color at a time and just filled in as I went trying to not group any one color too much. Using the sponge was nice since I could just rinse it out between colors. I was a little too excited about this project though and forgot to put anything in the pillow to prevent the paint from leaking through to the other side. At first I was bummed but then I decided to just stamp the same pattern on the back and that covered all the spots perfectly. For the arrow pillowI used the paint pen to draw out my arrows. Arrows are really easy to draw and all I really needed was the pen and a ruler to keep a straight line. I was able to draw larger scale arrows and also do my own unique pattern. I considered ironing the cases but then I remembered they were going in a playroom so I decided against it. All in all I spent about $34 on all three (plus a left over plain case) so even if these are spilt on or destroyed it's not a huge deal. 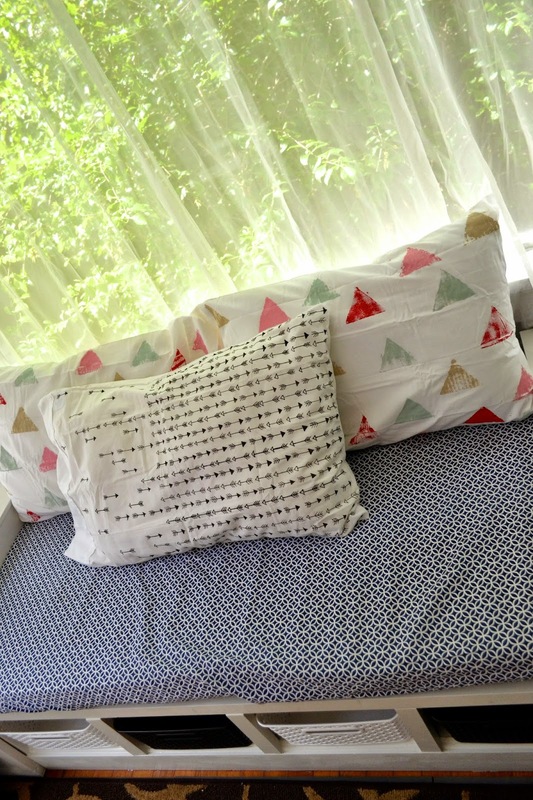 Since we used a crib mattress for the seat, we were able to just buy a crib sheet to cover it and call it a day. We got this one from Buy Buy Baby. 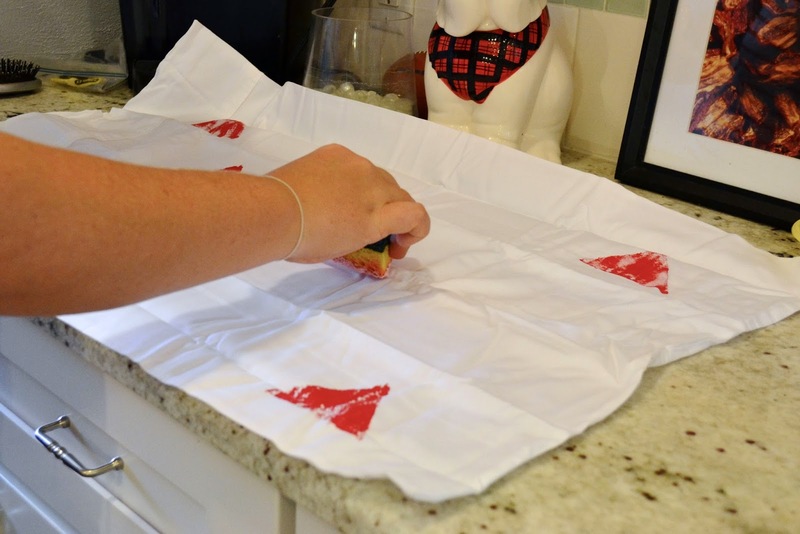 We really like that we can switch out the sheet if it needs to get washed... easy to clean = awesome in a playroom. Things are still looking a little unfinished since the doors aren't hung yet and we still don't have curtains (the sheers are just for a little privacy) but we're getting there. Slowly but surely. Oh, I love these! I was just looking at arrow fabric and wall paper online and was put off by the price too. I think this is the perfect solution, they look so cute! I may have to try it on the wall! 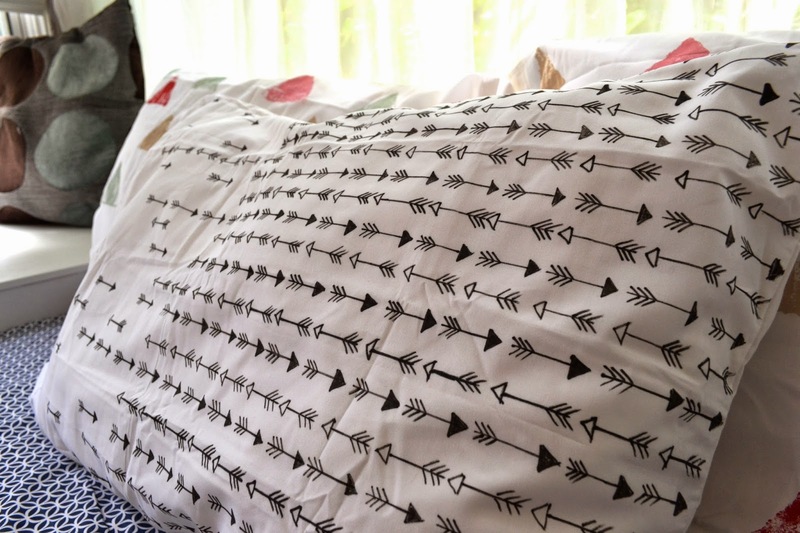 Love that arrow pillow case! Perfect. Thanks for linking this up to The Creative Collection Link Party! 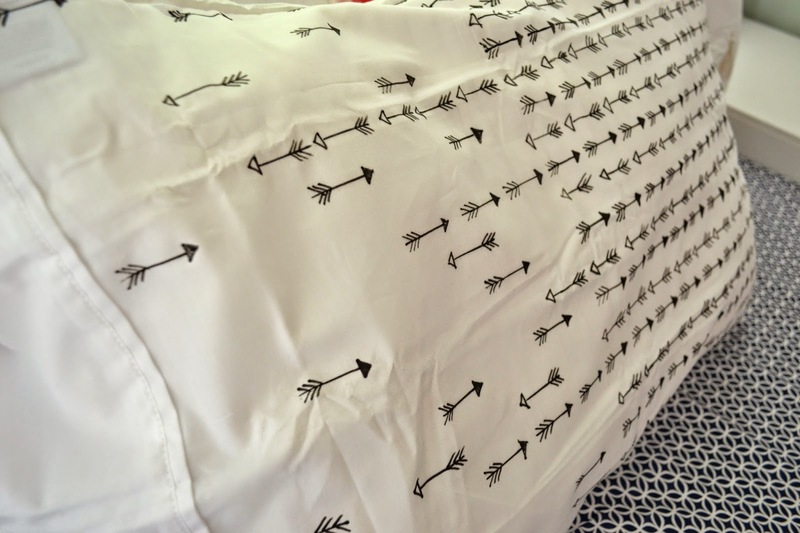 I like the arrows best too, so chic!